This is the kind of XNG truck that has been traversing Otsego County. The local trucks have the logo on the cab, but the trailers are plain white. TOWN OF BURLINGTON – An empty XNG truck en route south from the company’s Little Falls plant went off Route 205 about two miles south of Route 80 at 8:20 a.m. today, according to county Emergency Services Director Art Klinger. The driver was shook-up, but was able to tell emergency personnel arriving at the scene that the tanker was empty, Klinger said. “There was no release of gas at any time,” XNG Vice President Matt Smith emphasized in an email received a few moments ago. If the truck had been heading north from XNG’s northeast Pennsylvania’s plant, it would have been full and presented more of a challenge. The XNG team joined the Fly Creek Fire Department, sheriff’s deputies and county emergency services personnel, Klinger said. Chuck’s Towing from Richfield Springs and another towing service from Clinton were called to the scene and set the truck upright, Klinger said. 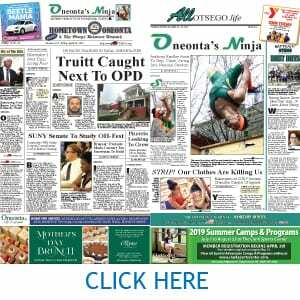 “We are sincerely appreciative of the rapid response and professionalism of the first responders involved, particularly the Fly Creek fire department and local police,” Smith said, who helped conduct the local training sessions Aug. 8 at The Meadows. Because emergency personnel, including Fly Creek firefighters, had undergone the day-long training at the Meadows, the mishap was handled with more confidence than otherwise, Klinger said. A number of XNG trucks – company officials and anti-gas activists provide different numbers – began cross the county in February, delivering natural gas from the Pennsylvania fracking fields to the company’s Town of Mannheim plant outside Little Falls, where it is put in the Iroquois Pipeline that proceeds to the Eastern Seaboard. XNG also delivers natural gas to a number of plants throughout Central New York. 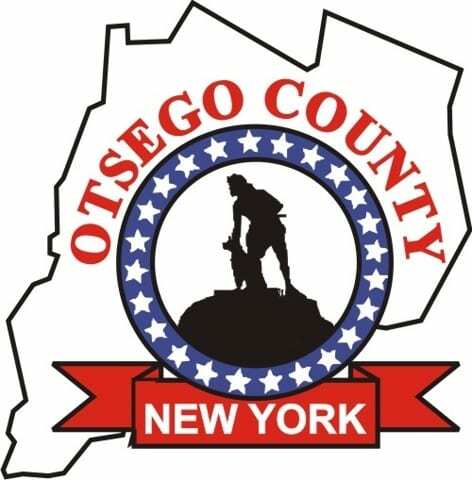 The route through Otsego County is up Route 205 from Oneonta’s west end, east on Route 80, then up Route 28 along Canadarago Lake, through Richfield Springs, before heading down Vickerman Hill to Mohawk. Thanks for covering this, Jim!! A fracking gas truck’s route includes going down the hill on route 80 to a T stop at route 28, up the congested west side of Canadarago Lake, and then on down Vickerman Hill? And now we have an “experimental” fracking gas truck apparently losing control, smashing on its side for no identied reason. Questions need to be asked, and answers transparently given! These trucks have pretty much ruined summer weekends for me, running all day and through the night 7 days a week. Do the math…they roll past in both directions roughly every 10 minutes and will surely increase in frequency when people turn on their heat. I hope all residents living on the route contact Sen Seward (seward@nysenate.gov) to ask that they be made to use the thruway, a road designed for convoys of trailers If they’re not waking you up at 3 in the morning, they’re drowning out your conversation at the picnic table. Also, you can call XNG and complain at 857-233-5329 or go to their site and email your concerns. Otherwise bye bye peace and quiet.